Review: V-Tech DS6421-3 Connect to Cell Phone System! You are here: Home / Great Deals / Review: V-Tech DS6421-3 Connect to Cell Phone System! I got the coolest thing to try out and tell y’all about! I keep saying it is the coolest thing – because it IS! I LOVE it! 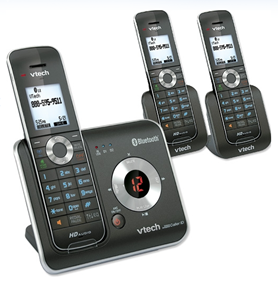 The V-Tech DS6421-3 Connect to Cell phone system! I was so excited waiting for this to arrive and when it did, I couldn’t wait to play with it! I LOVE it! I forgot to say it also announces your calls – so, if you are across the room or doing something else like getting laundry out of the washer and the phone rings – you can just wait for it to announce who it is! So, if it is a dreaded sales call, you will hear that and can ignore it! LOVE it! Learn More About Connect to Cell™ Technology! Expandable up to 12 handsets using only one phone jack. Conference an outside call between handsets and lines. Connect to CELL – Pair four different cell phones (or headsets) and have two devices actively connected. Cellular calls can be made or received from either of the two active cell phones. Landline service not required, works great for cellular only households. Access your cellular phonebook directory – Download your cellular phonebook directory to this cordless phone system?dial a landline or cellular call from the directory for easy access. Stores over 6000 directories from up to four different cell phones?no need to input names and numbers into your cordless phone. Make and Receive Landline and cellular calls – Connects to BLUETOOTH enabled cellular phones to make and receive cellular calls with the ease and comfort of a home phone system. Two cell phones can be actively connected to the base, cellular calls can be made or received from either of these two active cell phones. Pair four different cell phones to the base unit.